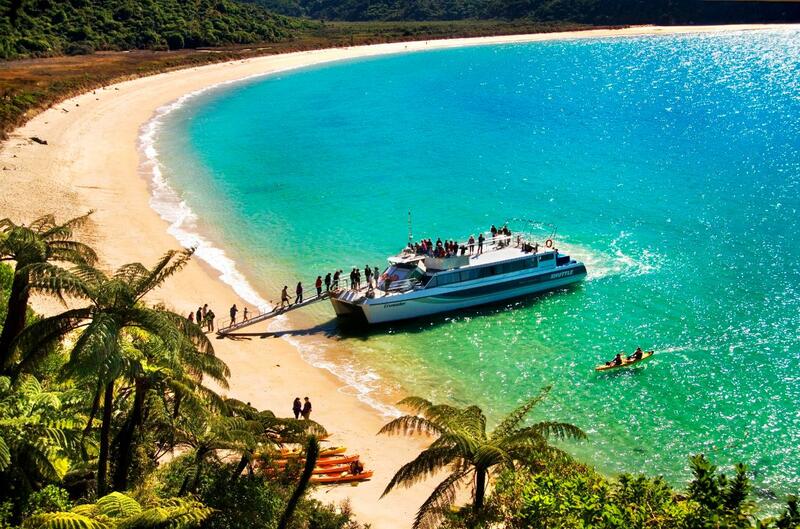 Our famous Discoverer Day is the ultimate boat cruise and walk combination in the Abel Tasman National Park. With three different walk options, the Discoverer Day offers all the best the Abel Tasman has to offer with a Full Park Scenic Cruise, visits to Split Apple Rock and a Fur Seal colony, golden beaches, forest walking and wildlife encounters all in one superb day out. Details: Departing Kaiteriteri at 9am and following a Full Park Scenic Cruise, drop-off at Awaroa at 11:00 and enjoy Five Beaches between Awaroa and your pick-up at Medlands Beach. This walk also features the option of stopping at the Awaroa Lodge Cafe, excellent views and native forests as well as a waterfall and lagoon at Bark Bay. A steep climb from Tonga Quarry requires a reasonable level of fitness. Pick-up from Medlands Beach 3:30pm,arriving in Kaiteriteri 4:30pm.